Tennis elbow, or lateral epicondylitis, is a painful condition that makes even the simplest tasks, such as picking up a gallon of milk or shaking hands, difficult. 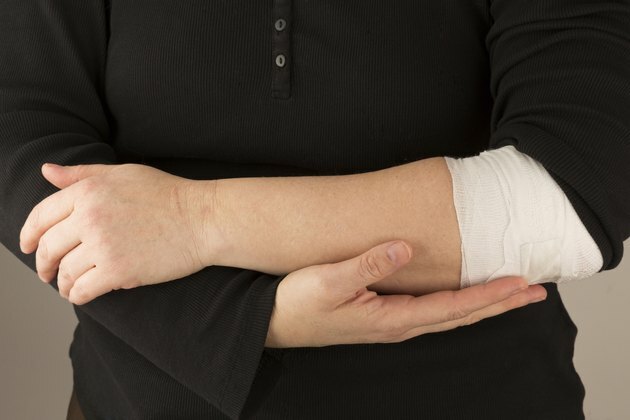 Even though it's called tennis elbow, you don't have to play tennis to get this injury. Plumbers, carpenters, butchers and construction workers can also get tennis elbow. Forearm exercises will help you ease the discomfort and can help prevent it even if you are not currently suffering from the condition. The classic symptom of tennis elbow is pain and tenderness on the outside of your arm, just below the bend of your elbow. You may even feel the pain running down your forearm toward your wrist when you pick up a heavy object, remove the lid from a jar or turn a door knob, for example. Your elbow joint may feel stiff and your grip may feel weak. Without treatment, the pain usually worsens and can last for several months. Getting rid of tennis elbow will not happen overnight and may take weeks and even months to cure. The best treatment and recovery plan involves several stages. The first stage involves resting your arm and avoiding activities that aggravate your elbow and may have caused it in the first place. Ice your elbow two to three times each day and take anti-inflammatory medication to help reduce swelling and pain. The next stage, once the pain has eased, involves regularly stretching the tendons and muscles. Then in the last stage, you must do forearm strengthening exercises. Two effective, do-anywhere stretches to reduce joint stiffness and help keep the muscles and tendons in your forearm flexible are the wrist flexor and the wrist extensor stretches. Simply extend the affected arm with your palm down. Bend your wrist so your fingers point toward the ceiling. With your other hand, pull your fingers back toward your body. You should feel the stretch under your forearm. Relax the stretch, point your fingers down and pull your fingers toward you until you feel the stretch in the muscles and tendons on the top of your forearm. Repeat in each direction 10 times and hold each stretch for 10 seconds. Wrist curls and reverse curls with a light hand weight are effective forearm-strengthening exercises. To perform wrist curls, hold the weight with the hand of the affected arm and then sit and rest your forearm on your thigh with the weight beyond the front of your knee. With your palm facing upward, bend your wrist and slowly curl the weight up as far as you comfortably can and then reverse your movement. For reverse curls, simply turn your hand over so your palm faces down and slowly raise and lower the weight with control. Perform each exercise 10 times. Another exercise simply involves squeezing a dead tennis ball 25 times. Repeat three times. If the pain returns during the exercise stage, stop and seek the advice of a doctor. Some tennis players get tennis elbow due to poor stroke mechanics, playing with a racket that is too stiff or has been strung too tightly or using a grip that is not the correct size. Have a tennis professional evaluate your strokes and racket. He can pinpoint any flaws and recommend changes.